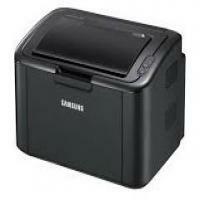 The Samsung ML-1650 is a laser monochrome printer that is easy to use and is best suited for offices use. It is large in size but is quite lightweight and saves money and space. It does not possesses features like colour printing and the facility to scan, copy and fax. The Samsung ML-1650 is 11.0 kgs in weight and measures 11.8 x 14.3 x 16.1 inches. It supports a maximum RAM size of 144 MB and can print at the rate of 17 pages per minute. Samsung ML-1650 Toner Cartridges have a monthly duty cycle of 40,000 pages. It is Mac, PC and Unix compatible. This printer has a paper input capacity of 600 sheets and a maximum resolution of 1200 dpi. It uses wired connectivity and offers Parallel and USB interfaces. This printer produces a sound emission of 49 dB. The media sizes it supports are Letter A, Legal, A4, A5, B5 and Folio whereas the media types that it supports are only envelopes and plain paper. The Samsung ML-1650 is a laser monochrome printer that cannot do colour printing and cannot scan, copy and fax. But it saves space due to its small size and saves money due to low cost of Samsung ML-1650 Toner Cartridges. It has good printing speed and can print high resolution documents. It is quite affordable and supports a wide range of operating systems. Overall it is a good printer and is good for fulfilling office needs. Q. Apart from Samsung ML-1650 toner cartridges, do you supply Samsung ML-1650 printer also? A. Unfortunately we don’t sell printers on this site. But you can find one on other supporting websites. We only deal in cartridges and other printer consumables like paper. Q. Can I know whether using compatible Samsung ML-1650 toner cartridges of your site invalidate the printer’s warranty? Do you provide any deals and offers? A. Compatible toner cartridges of our site won’t nullify your printer’s guarantee because they work as well as genuine toner cartridges do and are factory tested to the same ISO standards as the original ones. We at Printerinkcartridges.ie provide a guarantee on purchase of these cartridges that include returns policy, 12-month guarantee, free shipping and more. To know more, please contact our customer support. Q. What should be done if toner from a cartridge happens to fall on clothes and skin? I’m planning to replace Samsung ML-1650 toner cartridges, which I will be doing for the first time. Please help. A. If toner is strewn on your clothes or skin anytime, you need to wash it off right away with cold water. Doing this will minimise the problem that the scattered toner can cause. Avoid using hot water to clean the affected area is it may lock the toner on your skin or into the fabric further, which will complicate matters. Q. What are the media types and media sizes supported by this printer? A. The printer supports Letter A, Legal, A4, A5, B5 and Folio media sizes whereas the media types that it supports are only envelopes and plain paper. Q. Using this printer, is it possible to perform scan, copy and fax functions? A. No, this printer is a laser monochrome printer that does not have the facility to scan, copy and fax. Q. Can I print coloured documents using the Samsung ML-1650 printer? A. This is a mono laser printer that does not support printing in colour. Q. Do you supply original Samsung ML-1650 Toner Cartridges on this site? A. We supply both the original as well as the compatible version of the toner cartridges. However, we are limited only to the compatible version of Samsung ML-1650 Toner Cartridges for now. Q. The machine does not start when I tried to switch it on. I checked it but not able to detect the exact issue. Please help me! A. When such kind of problems occur the issue is generally with the cables that are not connected properly. Check that your printer has two cables connected to it: the power cable and the data cable. Make sure that these two cables are connected to both the printer and computer. Q. I am planning to buy the compatible Samsung ML-1650 Toner Cartridges in place of original ones since compatible ones are less in cost. Will this affect my printer’s print-quality? A. Not at all, we promise you the same print quality as of the originals. The compatible Samsung ML-1650 Toner Cartridges are equally efficient as the original ones. Use of compatible cartridges is always a wise option since it saves money offering more number of copies. Q. The error shown on my screen says ‘No paper’. I got such type of error for the first time and don’t know how to resolve it. Please help me. A. Without paper, your printer will not be able to print. Make sure you have loaded the paper into the printer paper cartridge or tray. Next, you need to verify that no printer paper is jammed or partially fed into the printer. If you suspect paper is stuck somewhere it shouldn't be, refer to your online user guide to solve paper jam issues. Clearing this would probably solve all your problems.